Access to reliable, clean water is integral to sustainable development and the transition to a green economy. But the world is consuming freshwater at rates that simply cannot be sustained, and freshwater ecosystems are under threat. Aquatic ecosystems are degrading faster than any other, and 60 per cent of the services they provide are being lost (MEA 2005). Globally, 24 per cent of mammals and 12 per cent of birds connected to inland waters have been classified as threatened (UN WWAP 2003). The situation is particularly daunting in developing countries, where 90 per cent of sewage and 70 per cent of industrial waste is dumped untreated into surface waters (UNWater, 2010). The international community has awoken to many of the threats facing our freshwater supply, but the importance of sound watershed management has been too often overlooked. partnerships and private investment structures. And it should employ proven market-based incentives to promote the adoption of sustainable land-use and watershed management practices. By applying such methods, policy makers can strengthen the participation of local communities and the private sector, reverse ecosystem degradation and safeguard critical ecosystem services. This report is meant to serve as a resource for governments and stakeholders who are interested in learning about market-based incentives for watershed management. 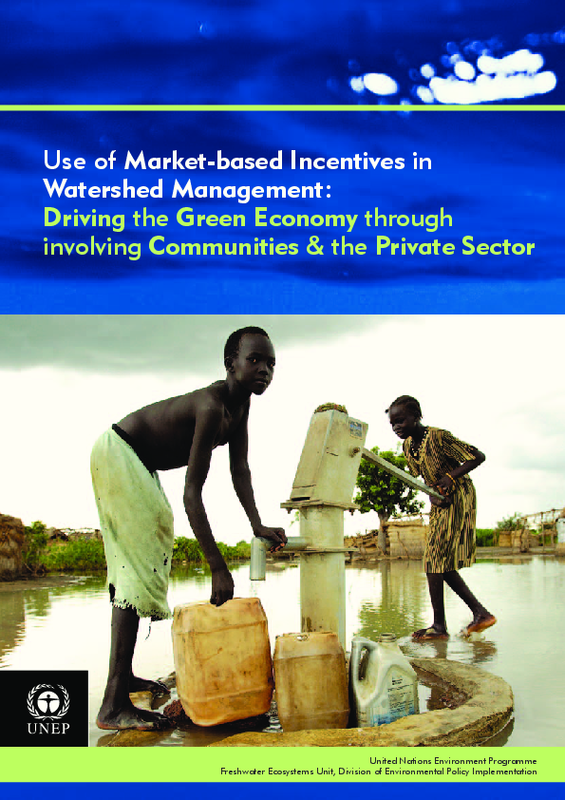 It presents 26 watershed-level case studies that demonstrate how market-based incentives have been used in different contexts across the globe, and it outlines key countrywide policy recommendations that governments can use to facilitate the uptake of market-based incentives. More importantly, the report can help policy makers understand the prerequisites for the successful implementation of market-based incentives for watershed management. governments can support local communities, strengthen the private sector and promote important synergies between ecosystem health and human well-being.